The kickoff return team (“Pride and Joy Team”) can set the tone at the beginning of the game, or reverse the momentum that the opponent has gained from a score. The latter, changing the momentum, is why we refer to the kickoff return team as our “Pride and Joy Team”. The players on this unit must be ready to demonstrate team pride and take joy in the process of laying a lick on our opponent. The well-blocked and well-executed return will give the return specialist an opportunity to excel. This play, the kickoff is no different than any other play during the course of a game, it requires a team effort. The better the 11-players execute their assignments, the great chance of success. 3. Set the tempo with at least one big hit, per return. In order to execute error-free the unit must know what their responsibilities are, and how to execute them – no different than an offensive or defensive play. The players must first and foremost be outstanding blockers, and relentless in the pursuit to execute their blocks, or willing to find somebody to hit if they miss their assignment. We will always huddle on the sideline (fifty-yard line) to allow the coach to count players and give them reminders. We specifically remind these players that this is the PRIDE AND JOY TEAM, so get a big hit and a score. The coach will make the return call and send the unit onto the field. We do not huddle on the field, so the players will get into the kickoff return formation. • Do they line-up without a huddle? o If our opponent does not huddle, then we will set up in our normal kickoff return alignment. • Do they huddle and break the huddle before the ball is signaled “ready for play”? o We will close our front seven down just in case they wait for the “ready for play” signal for a surprise onside kick. When the kickoff team breaks the huddle, the players will move to their return alignment. See diagram below. • Do they huddle and wait for the “ready for play” signal before they break the huddle? o We will close the entire unit down until the kickoff team breaks the huddle and then move to our return alignment. o Surprise onside – the front 5 players will fall on the football. The two wings will attack the kicking team’s front line players looking for big hits. o Surprise deep kick – cancels return call, and execute a field cross wedge return. • Scouting determines whether the kicking team breaks before or after the ready for play signal. • Adjust the front seven players just in case of some trickery. 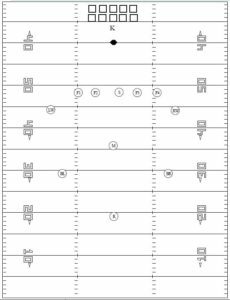 • Front – align at least one player about 2 yards wider than the huddle, on each side. • Move the Wings up 10 yards and the Short up 5 yards. • Deeper (4) players will align normally. • Surprise onside from the cluster, the inside 5 players must recover the ball, with the 2 wings sprinting at angle to collision the kicking teams players closest to the ball. • Deep kick from the cluster cancels the return call, and execute a field cross wedge. Front Align balanced in a football position, ¼ turn inside looking at the football; the outside foot is on the minus 49-yard line with the inside foot deeper. The outside players should be 2 yards wider than the huddle. When the huddle breaks retreat quickly to the normal alignment. Short Align balanced in a football position with the toes on the minus 45-yard line, in front of the kicker. When the huddle breaks retreat quickly to the normal alignment. 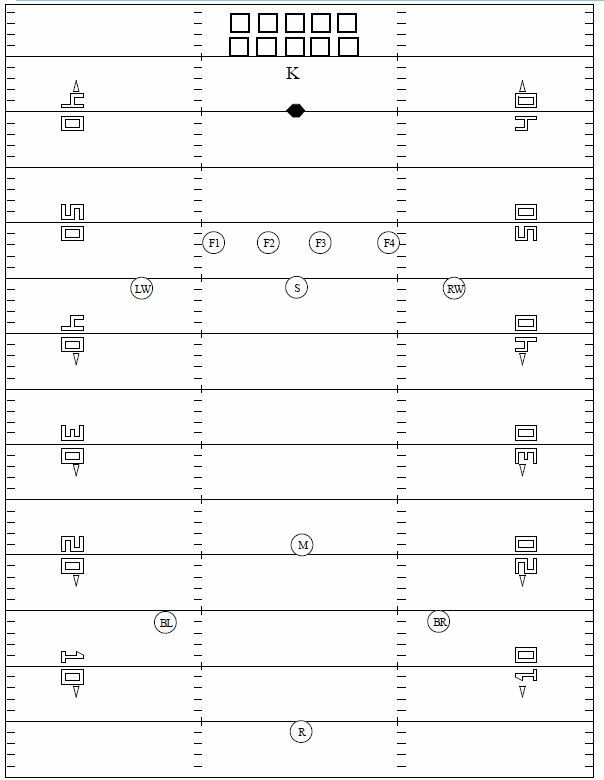 Wings Aligns balanced in a football position, ¼ turn inside with outside foot on the minus 45-yard line, 8 yards wider than the huddle. When the huddle breaks retreat quickly to the normal alignment. Middle Normal Alignment – heels on the minus 20-yard line. Backs Normal Alignment – toes on the minus 15-yard line. Returner Normal Alignment – toes on the minus 5-yard line. • Adjust the ALL eleven players just in case of some trickery. • Move the Wings up 10 yards and the Short to the front line. • Deeper (4) players will align 15 yards closer than normal. • Surprise onside from the cluster, the inside 5 players must recover the ball, with the 2 wings and middle are sprinting at angle to collision the kicking teams players closest to the ball. Short Move to the middle of the front line, offset one yard from the ball. When the huddle breaks retreat quickly to the normal alignment. Middle Move up 15 yards – heels on the minus 35-yard line. When the huddle breaks retreat quickly to the normal alignment. Backs Move up 15 yards – toes on the minus 30-yard line. When the huddle breaks retreat quickly to the normal alignment. Returner Move up 15 yards – toes on the minus 20-yard line. When the huddle breaks retreat quickly to the normal alignment.